THE NIBBLE. One of our NIBBLE colleagues is currently vacationing in India. Passing through Delhi, he dined at an haute cuisine Chinese restaurant, The House of Ming. It features both Cantonese and Szechuan cuisine, but our intrepid reporter went straight for the dim sum (Cantonese). 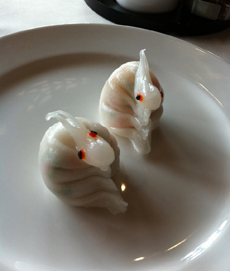 From the field, here is his photo of Chef Wang’s irresistible rabbit-shaped steamed crystal dumplings. The eyes are made of chili oil and black sesame seeds. It is the Year Of The Rabbit, after all (or will be on February 3, the first day of the Chinese year 4709). While the Chinese New Year is always celebrated with good food, we’ve never seen a better interpretation of the theme. You’ve got a couple of weeks to try your hand at making rabbit dumplings and impress your friends at a celebration for the Year Of The Rabbit. Then send us the recipe. Or better yet, we could come to your place for dinner, assuming you’re a lot closer for us than the 40-hour round trip to the House Of Ming. Conventional dumplings are made from all-purpose flour. The translucent, chewy skin of crystal dumplings is a result of mixing wheat starchwith rice flour and tapioca. Here’s a recipe. Here’s a cooking video that shows how easy it is to make basic dumplings. The Chinese word for dumplings is jiaozi, pronounced gee-OW-za—similar to the Japanese word for dumplings, gyoza, pronounced GYOO-zah.